Dr Charles B. Huggins had just finished his internship as a medical doctor, and had never performed any medical research when he came to the University of Chicago. Assigned to work as a urology surgeon, he purchased a urology textbook and read it several times, virtually memorizing the book in about three weeks' time before starting his new job. Although he was a capable surgeon, he was far more capable at research, and eventually came to devote all his time to the laboratory. 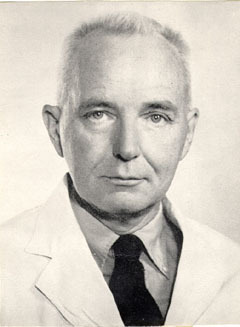 Huggins was awarded the 1966 Nobel Prize for Medicine, shared with Peyton Rous, for his research showing the relationship between certain hormones and certain cancers. In his most important research, he proved that administration of the female hormone estrogen slowed the growth of prostate cancer in males. Hormone therapy, also called androgen ablation, is now a common treatment for prostate cancer, and he also recommended "the Huggins operation" -- castration -- for particularly advanced cases. In separate research, he showed that some breast cancers can be slowed by removing the ovaries and adrenal glands, which produce estrogen. Medications that block the body's production of estrogen are now part of the standard treatment of breast cancer. Prior to Huggins' work, cancer was generally treated only with surgery and painkilling drugs. His son, Dr Charles E. Huggins, developed a better method for freezing and thawing donated blood, allowing blood to be stored almost indefinitely.